Make faux ribbon with just a few items. Gather a ribbed bottle cap--I used the cap of a bottle of rubbing alcohol; the coke bottle cap I tried first didn't work well--VersaMark, strip of cardstock, ink to match cardstock (Rose Red used here). polka dot stamp (from SU! 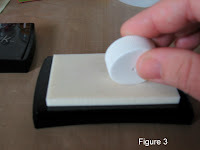 's new punch box), and Whisper White Craft Pad. 1. 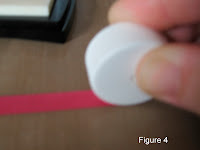 Cut cardstock into a strip the width of what you want your ribbon to be (Fig. 1). 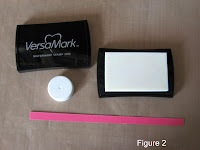 2.Take the bottle lid and ink it up with the VersaMark. Stamp it on the cardstock strip all the way to the end (Figs. 2-4). You should end up with Figure 5. 3. 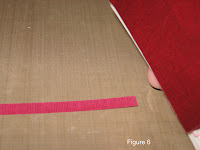 Run edges of strip across coordinating ink pad to define edges (Fig 6). 4. 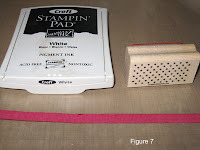 Stamp polka dots on strips using Whisper White Craft Pad (Fig. 7). Use on cards, scrapbook pages, or other projects where you want a piece of flat ribbon. Sorry about the formatting...can't figure out HTML. This is way to cool. I just love trying new techniques. You made it so easy to follow. Great tutorial. I must try this ASAP as I have no polka dot ribbon. Great idea...thanks for posting it! Wow! I would have never thought of it! I knew you would be able to do something like this. You need your own shop . You'd make a fortune!!! Where do I get a stamp like that? Also, I need a new catalog. Too cool...can't wait to try this! This is so cool! Thanks for sharing! I can't wait to try it! !